1 of 2 Lightly coat a 13 x 9 x 2-inch baking dish with nonstick cooking spray. In a large saucepan, combine milk, 1 cup water, garlic powder, salt and pepper. Bring to a simmer over medium-high heat. Gradually whisk in polenta. Cook, whisking continuously, for about 2 minutes, until thick. Add a little hot water if mixture becomes too thick. Stir in Asiago cheese and fresh basil. Spread polenta in prepared baking dish and allow to set at room temperature. 2 of 2 Heat olive oil in a large nonstick skillet over medium to medium-high heat. Add onions and cook 8 minutes, stirring occasionally, until golden. Remove to a plate and wipe out skillet. 1 of 3 Heat olive oil in same skillet over medium heat. Add chard (in batches) and garlic and cook 5 minutes, stirring occasionally. Season with Italian seasoning, salt and pepper. Stir in beans and heat through. 2 of 3 Assemble casserole. Heat oven to 350 degrees . 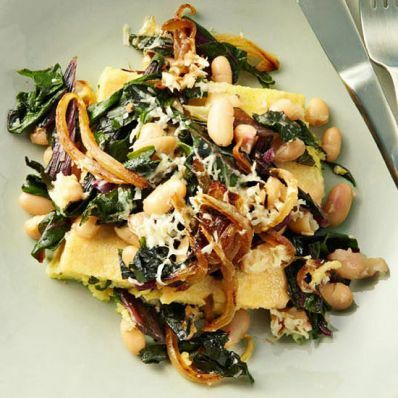 Spoon chard and beans evenly over polenta. Sprinkle 1/2 cup of the Asiago cheese over chard and beans. Scatter onions and remaining cheese over top. Bake, uncovered, at 350 degrees for 15 minutes. 3 of 3 Allow to cool slightly before slicing. May also be served at room temperature.